Yesterday’s naming of Stephen Colbert as David Letterman’s successor continued to ripple across the media, spurring comments from the likes of Rush Limbaugh (about how this is tantamount to CBS having “declared war on the heart of America”) and Breitbart.com’s Ben Shapiro (who called Colbert’s act “vile political blackface”), as well as from people who actually matter. Most importantly, it prompted most of Colbert’s late-night colleagues to weigh in, many of them with takes that were just as amusing. First up, Craig Ferguson continued to be a perfect gentleman about the whole thing, starting off The Late Late Show by saying, “First of all, before we begin tonight, may I congratulate the lovely Stephen Colbert on getting The Late Show. Isn’t that lovely? Congratulations Stephen! A fine addition to the CBS cavalcade of stars.” (There’s no video, so that’s according to Variety’s transcript.) Ferguson then propped his feet on his desk and refused to do any more jokes until someone brought him his $5 million—or, at least, that’s what we would have done. Ferguson is more of a professional than that, which is why he has a talk show. Over on NBC, Jimmy Fallon reminded everyone that the days of The Late Shift rivalries are well behind us, now that the poisonous influence of Jay Leno is gone. Colbert’s “competition” had nothing but effusive praise to offer, with Fallon downplaying any notion of “a new late-night war,” as some in the media are supposedly calling it (even though we haven’t seen anything of the sort). “I just want to say there’s not going to be any war. It’ll be a dance-off,” Fallon said, ever the gregarious goofball. He probably means it. Seth Meyers—who, in a very roundabout way, also inherited David Letterman’s old gig—used the opportunity to brag repeatedly that, like Colbert, he went to Northwestern University, “so that’s very exciting for me.” Oooh, the almost-Ivy League! That is exciting. Meyers also expressed relief that he’ll no longer be the lowest man on the hazing totem pole when it comes to new late-night hosts. Wait, who’s hazing Seth Meyers? Don’t they know he went to Northwestern? Over on The Daily Show, Colbert’s old boss Jon Stewart built on his earlier comments to Vulture, praising Colbert as a “genuinely good man” who’s more than worthy of the challenge, and who absolutely deserves to see his name up on the marquee of the Ed Sullivan Theater. (“Assuming that’s where they tape it,” Stewart hastened to add.) 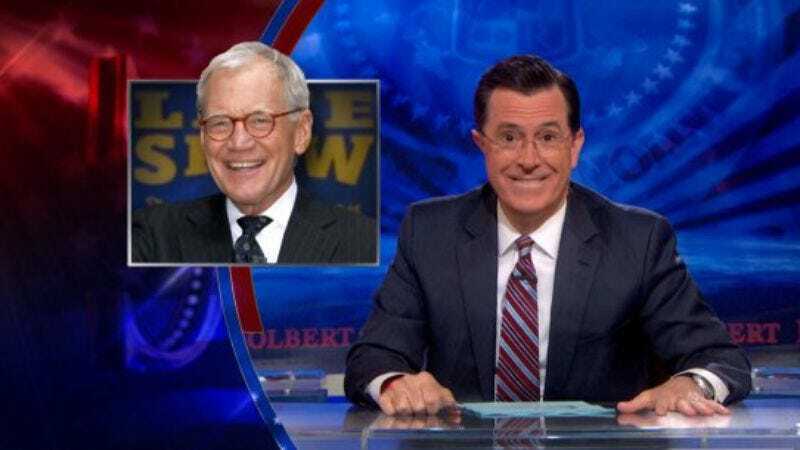 He also dug up a clip from Colbert’s days as a correspondent, giving everyone a little taste of what it will be like to see him break character—and a reminder of how sad it will be to not have that Stewart/Colbert interplay around anymore. And finally, Stephen Colbert’s ascension did not escape the notice of “Stephen Colbert,” who paid tribute to Letterman while also expressing pity for the man who would dare attempt to take over his job. If he thinks that’s daunting, just wait until “Colbert” hears he’ll be dead by the end of the year.